A plant's genome is the full complement of inherited genetic information. Within this set of instructions, individual genes are being discovered that control critical traits with breeding applications. As new discoveries are made, we will describe them in short summary articles as “Jewels in the Genome" (Iezzoni, 2010). This article reviews the physiological and genetic bases of tomato chilling injury. Tomato is one of the most popular and economically important vegetables and is cultivated globally. However, it is susceptible to chilling injury (CI), a postharvest physiological disorder caused by improper storage temperatures that result in several symptoms including sunken areas on the fruit (blemishes), disease susceptibility, and inhibition of color development and ripening. Generally, cold storage is used to maintain and control the quality of the harvested crop; however, tomatoes are chilling sensitive at temperatures below 15 °C (59 °F) if held for longer than two weeks or at 5 °C (41 °F) for longer than 6–8 days (Fig. 1). Important practices related to the management of the postharvest crop can alleviate the development of these symptoms and maintain good produce quality. Recommendations for maintaining postharvest quality of tomatoes are available. Figure 1. Tomatoes exposed to temperatures below 15 °C for 2 weeks or longer develop symptoms of chilling injury, including failure to develop full color, irregular color development, or premature softening. Photo used with permission of University of California Postharvest Technology Research and Information Center. Understanding and management of CI requires the generation of information on the physiological and genetic characteristics of CI; examination of the development of CI and sensitive indicators that are reflective of cultivar-dependent cold tolerance differences are needed. In a study by Zhoa et al. (2009), two tomato cultivars were evaluated for physiological and genetic properties that may make them differ in cold tolerance. Solanum lycopersicum cv. Lichun, a cultivar that is less cold tolerant, was compared to S. lycopersicum cv. Santium, a cultivar that is more cold tolerant. The physiological indices of ion leakage, malondialdehyde (MDA), proline content, and the activities of antioxidative enzymes—catalase (CAT) and peroxidase (POD)—were analyzed in this experiment. These variables were used to describe the physiological state of plants exposed to chilling stress and represent good indicators for susceptibility to chilling injury. The expression of a key regulator of cold response was also detected. LeCBF1, a putative transcriptional activator identified in S. lycopersicum by Zhang et al. (2002) is a member of the C-repeat/DRE DNA binding domain gene family and is considered an important regulator of expression of downstream genes induced during cold conditions. The chilling index analysis is an analysis used in the study of postharvest fruits exposed to low temperatures during storage and it is a direct indicator that reflects the development of CI symptoms in postharvest fruits. In the study, (Zhoa et al., 2009) this index was determined from visual assessment of the severity of the symptoms using a 4-stage scale and the average extent of cold damage was expressed as the CI index. 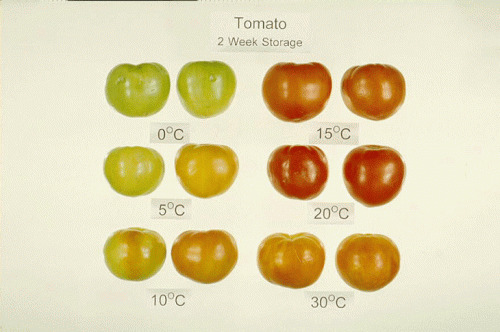 Tomato fruits were chilled at 2 °C for 5-, 10- and 15-day cold storage and then stored for an additional 3 days at 20 °C prior to fruit evaluation. These fruit assessments showed that the CI index for both cultivars increased dramatically for fruits stored under chilling temperatures for 10 days or more. Ten days was determined to be the main development time for symptoms of CI to manifest in postharvest tomato fruit. It was also concluded that the CI index for cv. Lichun was significantly higher than cv. Santiam at the same storage time, indicating that cv. Santiam was more cold tolerant. The physiological analysis effectively reflected CI development in postharvest tomato fruits (Zhoa et al. (2009). A high correlation coefficient (R2 = 0.9661) between ion leakage and the CI index was a clear indicator of the injury development phase and the severity of injury. There was also a sharp increase in MDA and proline content at or before the time of the main development phase of CI (10 days). Fluctuating CAT and POD activities could not be considered sensitive indicators of CI development because their regular changes did not appear until the main development phase ended. Zhoa et al. (2009) concluded that the physical properties of ion leakage, MDA, and proline content could be used as effective indicators for CI analysis in postharvest tomato fruits. The expression of the LECBF1 gene swiftly responded to low temperatures with increased expression within 1 hour of exposure to cold temperatures. The accumulation of the gene transcripts in the two cultivars was also different with Santiam accumulating higher transcripts earlier in the cold treatment. The correlation coefficient between the CI index and the relative expression of LeCBF1 was -0.9176. These results suggest that LeCBF1 can be used effectively in fast testing the cold tolerance of tomato and selecting tomato fruits that are more cold tolerant. These results could provide valuable prediction tools in the analysis of CI and also in the selection of tomato cultivars that produce more cold-tolerant fruit. Vega-Garcia et al. (2010) looked at changes in protein expression associated with chilling injury in tomato fruit. The proteins identified were involved in carbon metabolism, oxidative stress, photosynthesis, protein processing, and degradation, and two (thioredoxin peroxidase and glycine-rich RNA binding protein) were related to cold stress (Vega-Garcia et al., 2010). The mechanisms by which these proteins operate and how any enzyme performs under chilled storage show that there are several mechanisms needed to maintain cellular homeostasis under cold stress. Variation in the proteins involved in these pathways could provide insights into why one variety is more cold tolerant than another. Characterization of these cold-stress-associated pathways and the proteins involved can contribute to the identification of potential markers to detect the disorder at early stages of chilling injury. They may also provide candidate genes to assist in the breeding of cold-tolerant tomato genotypes. A paper by Venema at al. (2005) on the inheritance of chilling tolerance in tomato indicated some of the problems associated with the development of more cold-tolerant tomato genotypes. Some of the constraints mentioned include lack of information on proteins identified that are involved in cold tolerance and the lack of quantifiable physiological parameters related to low temperature tolerance. When these challenges are adequately addressed, more progress can be made in the effective breeding of tomatoes with enhanced tolerance to low temperatures. Vega-García, M. O., G. López-Espinoza, J. Chávez Ontiveros, J. J. Caro-Corrales, F. Delgado Vargas, and J. A. López-Valenzuela. 2010. Changes in protein expression associated with chilling injury in tomato fruit. Journal of the American Society of Horticultural Science 135: 83–89. (Available online at: http://journal.ashspublications.org/cgi/content/abstract/135/1/83) (verified 24 Mar 2012). Venema, J. H., P. Linger, A. W. van Heusden, P. R. van Hasselt and W. Bruggemann. 2005. The inheritance of chilling tolerance in tomato (Lycopersicon spp.). Plant Biology 7: 118–130. (Available online at: http://dx.doi.org/10.1055/s-2005-837495) (verified 24 Mar 2012). Zhang, X., S. G. Fowler, H. M. Cheng, Y. G. Lou, S. Y. Rhee, E. J. Stockinger, and M. F. Thomashow. 2004. Freezing-sensitive tomato has a functional CBF cold response pathway, but a CBF regulon that differs from that of freezing-tolerant Arabidopsis. Plant Journal 39: 905–919. (Available online at: http://dx.doi.org/10.1111/j.1365-313X.2004.02176.x) (verified 24 Mar 2012). Zhao, D. Y., L. Shen, B. Fan, K. L. Liu, M. M. Yu, Y. Zheng, Y. Ding, and J. P. Sheng. 2009. Physiological and genetic properties of tomato fruits from 2 cultivars differing in chilling tolerance at cold storage. Journal of Food Science 74: C348–C352. (Available online at: http://dx.doi.org/10.1111/j.1750-3841.2009.01156.x) (verified 24 Mar 2012). Suslow, T. V. and M. Cantwell. Tomato recommendations for maintaining postharvest quality [Online]. Postharvest Technology Research Information Center, Department of Plant Sciences, University of California, Davis. Available at: http://postharvest.ucdavis.edu/pfvegetable/Tomato/ (verified 27 Mar 2012).